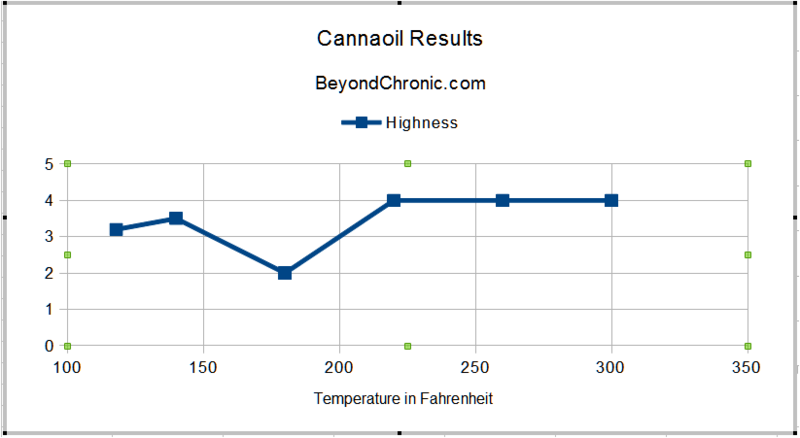 As I previously wrote, a week or so ago I began some experiments to find out if infusing coconut oil with cannabis worked differently at different temperatures. Each batch was made as identically as possible, using 2 tablespoons of coconut oil and 0.5 grams decarbed weed (Super Silver Sour Diesel Haze, a sativa-heavy hybrid) heated for 2 hours (except the 118°F batch, which was heated for 4 hours per the instructions I remembered seeing for that one). All doses were consumed as a single teaspoon of well-stirred liquid oil poured over a bowl of salad, immediately after eating a meal so as to preserve First Pass Effect. What follows are the contemporaneous notes I made as I took each randomized dose, not knowing which temperature was which until all the results were in. Here are the doses in order of consumption. 1. After 45 minutes, this came on strongly at about [4.5] and soon settled down to a solid  that lasted a bit more than 6 hours. My head felt a bit foggy all day, but less than it does when I feel depressed. The high was very indica-like with body effects such as lassitude. 2. After 50 minutes, this started slowly but noticeably at around , and gradually crept up to about [3.5], but with a distinct sativa feel. Absolutely no body effects, suddenly got in the mood to write (and did so!). Felt “lighter” mentally than dose 1; no fogginess at all. 3. Next to nothing…very subtle, perhaps a  or so. It’s varied between feeling like “a bit of sativa” and “a bit indica”, or at least a bit foggy. But I’m going to need a few vape hits to fall asleep tonight, so essentially nothing. 4. I’m gonna call this as a [3.2]…and very similar to the effect of the weak beer known by that number 🙂 A clear head, but not much of a high, and no pain relief at all. Better than nothing, but most people wouldn’t even feel it. 5. Nothing whatever after two hours in. Update: but feeling definitely odd after 3 hours in! It’s not a normal high, have some visual distortion and a lot of “hitting the wrong keys”. Not even sure what level, because I don’t feel anywhere near a , but I still wouldn’t drive because not sure where this is going. 6. A solid , great for watching an old movie with Felicity. There seems to be an anomaly for the 180°F result, but that’s the problem with one-off experiments and why we need more and better data that we can analyze statistically (again, I’m going to ask if anyone knows a good laboratory interested in getting a lot of publicity). Anyway, what all this seems to show — and remember, I was using pretty low doses on purpose, approximately 80 mg. of cannabis — is that virtually any reasonable temperature will work, but that higher temperatures seem to start bringing more sedative effects to the fore. Hey. Cool experiment! Keep it up! Thank you! Now, if you were only in California…! Nugs and hugs! How did you de-carb the weed for the experiment? Same way I always do: 225°F for a full hour, as outlined in Step 3 here. Great site! I think that de-carb is not necessary.What is your opinion? It’s only necessary if you want psychoactive effects! It wont be as psychoactive. The decarb takes unactivated thc and actives it. THC-A isn’t very psychoactive, but after the decarb it converts it to the loveable THC. I made some yesterday, not to eat, but to massage into my father’s feet. He has chemotherapy-caused neuropathy in his feet and I’m hoping the oil and the massages will help relieve pain and bring back some sensation. I should add that I used the Little Dipper! Perfect for a small sample project. I also made some canna-chocolate today for the old man. 😉 He needs to get better so we can take care of my step-mother, recently diagnosed with ALS. I’m on a kind of marijuana mission right now. Now that’s what I call excited 🙂 Glad you’re so happy! Nugs and hugs!